Burgers here are made from grass-fed beef sourced from local farms, hand formed into quarter pound meatballs, cooked in butter, and then smashed to form a perfect crust that traps all those glorious juices. 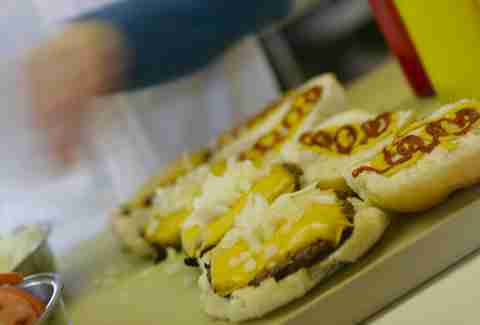 Build your own, or choose from 14 combos including the Aussie (lettuce, tomato, ketchup, cheddar, and a fried egg). Oh, and there’s also a not-so-secret menu you can access online with six additional burgers like the Quebecois (which is basically poutine on a burger). 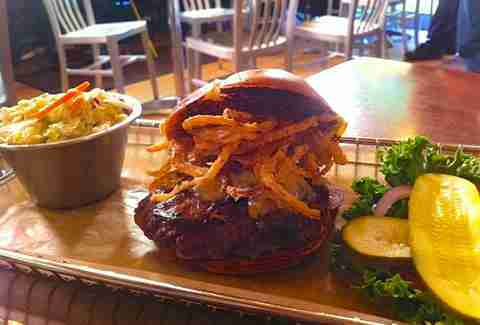 The 8oz patties here are made in-house using hand-ground brisket and chuck, grilled medium-well, and cooked to order. There are several burgers to choose from, but how can you pass up the one that comes smothered in Gruyère and topped with Dijon, baby spinach, caramelized onions, and bacon? That's the Deux Chevaux. 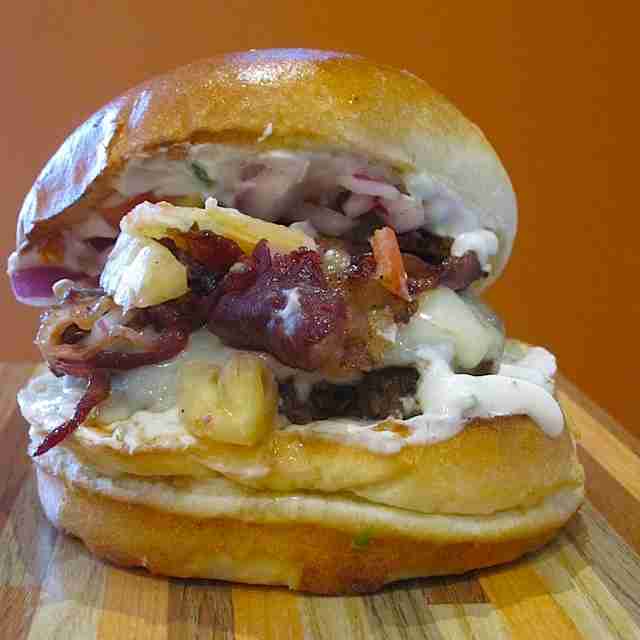 Burgers are made from Ontario-raised, grass-fed beef, never frozen, and served on ACE Bakery buns. 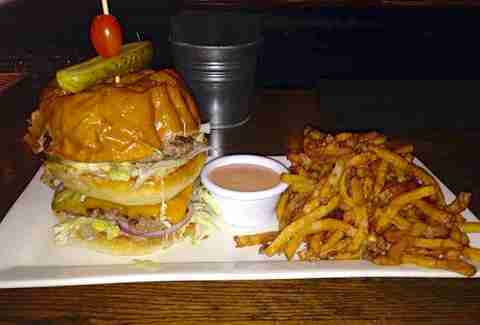 Build your own burger from 30+ toppings available, or go for one of their signature burgers. There’s no wrong choice, but a prime rib burger with bacon and cheddar will always hit the spot. 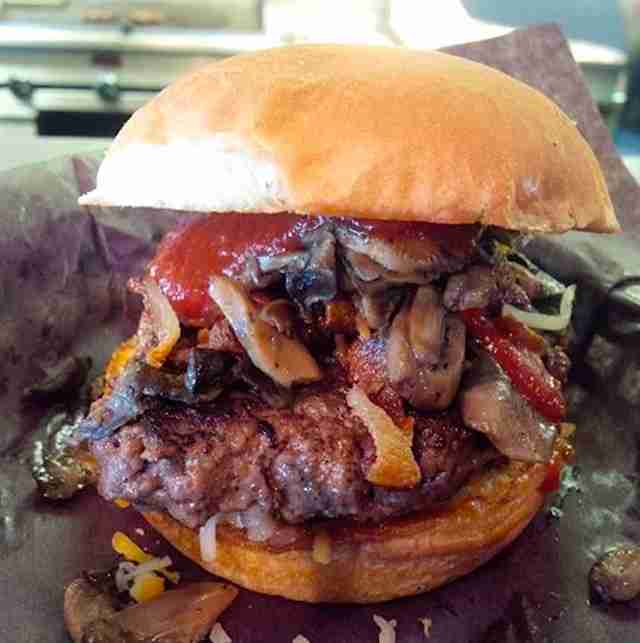 Webers has been serving burgers to Ontarians heading to and from the cottage since 1963. The iconic spot on Highway 11 cranks out handcrafted all-beef, charcoal-grilled patties to hordes of hungry people every summer. You can visit year-round, but it’s May through September when you’ll be greeted with a massive line. No matter which of the two Hamilton Chuck’s locations you find yourself at, you’ll be getting all-natural burgers made in-house with no fillers or binders -- just meat (which is really all you need). 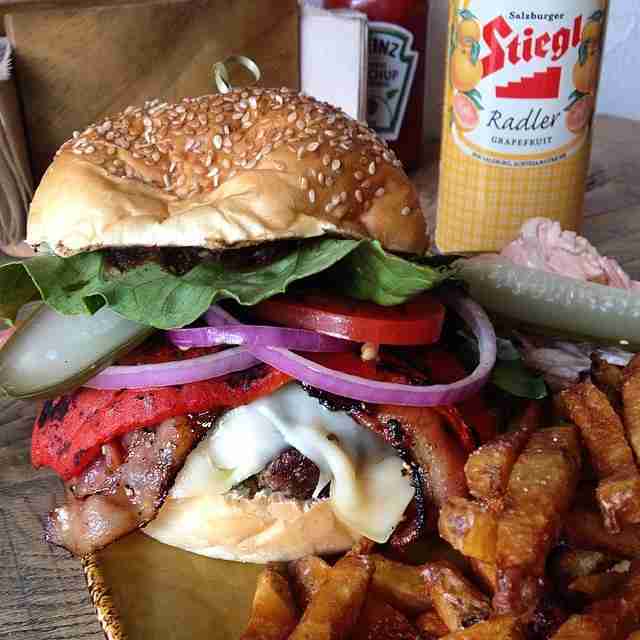 Choose from several proteins including Angus beef, venison, lamb, bison, and bacon -- as in, your burger is made of bacon, not just topped with it, and a ton of free toppings. Patties here are made from locally reared, grass-fed beef, flame-grilled and served on a toasted pretzel bun -- go classic and you get a 5oz patty with a short list of toppings (basics free, premiums will cost you), or choose from the 10 signature burgers. 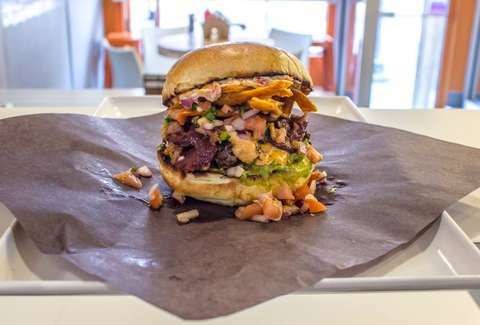 The flavour-packed Rebel sees a 5oz patty topped with roasted garlic mayo, potato chips, tomato, lettuce, cheddar, jalapeños, and avocado spread. Yet another burger joint where you can feel good about what you’re about to inhale, Harper’s makes its patties with AAA local beef raised using sustainable methods. White, whole wheat, and pretzel buns are available, or you can opt to “double down” which means getting your beef puck between two grilled cheese sandwiches. There are 12 topping combos, including the aptly named Delicious, topped with Havarti, crispy onion straws, avocado spread, and BBQ sauce. All burgers come with the classic combo of lettuce, tomato, onion, and pickle, and beyond the basics, there are a number of signature burgers to choose from that could satisfy any craving. Skipped breakfast? 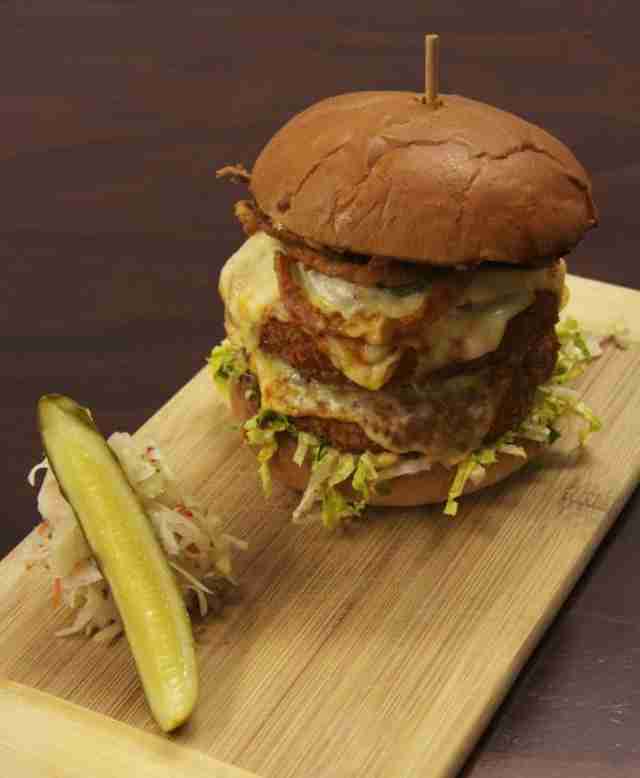 Get the Kenzie, a burger topped with a fried egg, cheddar, and bacon. In the mood for bacon? 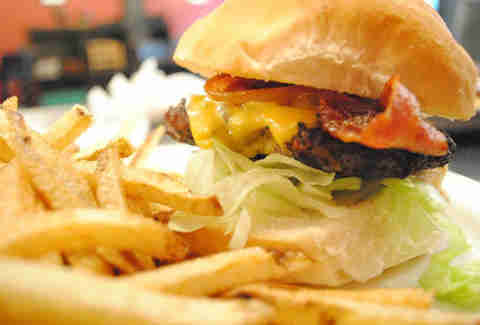 The Baconator will cure what ails you -- it involves double meat, double bacon, double peameal bacon, and double cheddar. Whoa. 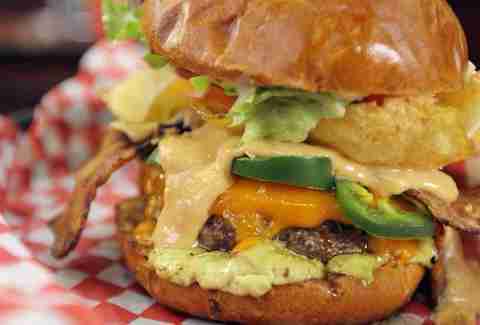 The concept at Frat Burger is as simple as its motto: “Do burgers right!”. What you get here are quality beefwiches made from local Ontario cow-cuts that’re ground daily on-site and cooked to order. Each 5oz beef patty can be topped any way you like -- basic toppings are free and then additional premium toppings will cost you, and include the likes of cranberry sauce, hash browns, peanut butter, and grilled pineapple. Anywhere that has “BBQ” in the name is likely going to do a good job serving up a decent burger and this place is no exception to that rule we just made up. 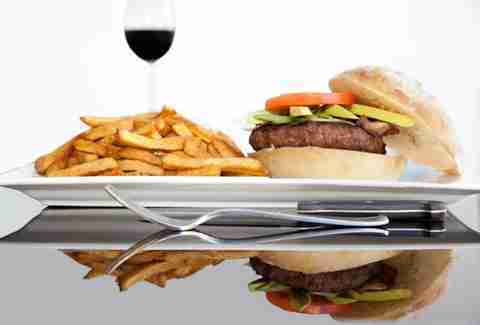 Its beef burgers are grilled to order and served up on a toasted bun with hand-cut fries or slaw. Ease into things with the Basic Burger that keeps things simple with lettuce, tomato, pickle, and shaved red onions, allowing the grilled patty to take centre stage.